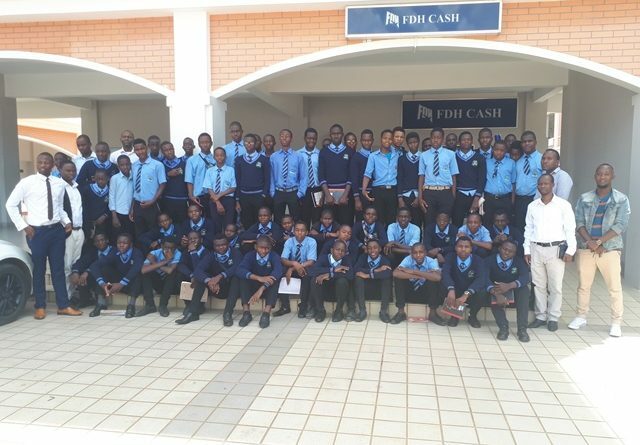 A group of students from William Murray Secondary School in Nkhoma, Lilongwe on March 15, 2019 travelled the over 700km to visit the Malawi University of Science and Technology (MUST) in search of academic inspiration and motivation. The 40 students and teachers were taken on a campus tour before listening to presentations on the university’s history, academic programmes on offer, their requirements for selection, general academic life at MUST and tips on university placement application process. The presentation was done by MUST Communications Manager James Mphande. The boys in navy blue trousers and sweaters and sky-blue shirts were also treated to motivational talks by two staff members—Walusungu Gondwe and Maxwell Banda–who are former William Murray Secondary School students. Gondwe is a lecturer in Computer Studies while Banda is Assistant Registrar responsible for Human Resource Development and Management. The two shared their life experiences at William Murray and how some of the things there helped to shape them into what they are today. They also offered tips on how to realise one’s goal in life. The students were then an opportunity to ask questions and most of them revolved around requirements for selection and life at MUST. One of the teachers, Ezra Chikakuda, hailed MUST for the time it gave to the students, saying such visits help the students to realise that secondary school education is only a bridge towards university. MUST receives tens of secondary schools every month for educational visits. In some cases, even primary, nursery and Sunday school children also pay the university educational visits. According to MUST management, this is one of the ways in which the university contributes towards education in Malawi as most of these visiting students go back home inspired and motivated to work harder and make it to university.